I wanted to like this book. I REALLY wanted to like this book. Not necessarily because it isn't a good book (well, maybe not necessarily), my mom enjoyed it, for example, but because it didn't actually say anything about Ikigai other than its definition. The idea behide Ikigai is that if you have meaning if your life, you will be able to depending on that meaning through difficult times (resiliency), and have a reason to wake up in the morning. This meaning is part of the reason why people who live long live long. Except that we don't really know why some people live longer than other people. Something something telomeres, which are barely mentioned in the book, be happy, have a strong community, be less stressful, eat lots of fruit - or was it vegetables, walk a lot, none of the people who live a long life actually KNOW why they live long. Some themes appear, but they don't KNOW. The book is best described as skimming the surface of many reasons given why some people live longer than others (see above re: meaning, stress, community, exercise, vegetables). It tells us what but doesn't give how, or even offer any suggestion beyond "figure out what you're doing when you're in flow, and do more of that" to find meaning. I'm not against books that skim the surface of many topics, The Antidote and The Happiness Hypothesis are two of my favorite self-help books, and both are similar in their approach of "many ideas under one theme" that Ikigai uses. Yet they work, and this one didn't. Unsure why. I wanted to like this book. I found it too shallow. So, while I'm glad I read it (so that I won't wonder now if I should read it), I wouldn't hand it to anyone to read. I'm more likely to hand them Frankl's Man's Search for Meaning. Nurturing friendships, eating light, getting enough rest, and doing regular, moderate exercise are all part of the equation of good health, but at the heart of the joie de vivre that inspires these centenarians to keep celebrating birthdays and cherishing each new day is their ikigai. 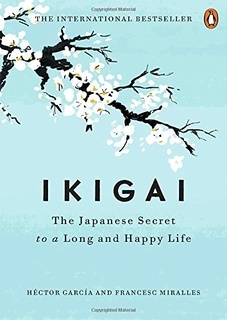 Certain longevity studies suggest that a strong sense of community and a clearly defined ikigai are just as important as the famously healthful Japanese diet—perhaps even more so. Stress has a degenerative effect over time. A sustained state of emergency affects the neurons associated with memory, as well as inhibiting the release of certain hormones, the absence of which can cause depression. A powerful antioxidant, melatonin helps us live longer, and also offers the following benefits: It strengthens the immune system. It contains an element that protects against cancer. It promotes the natural production of insulin. It slows the onset of Alzheimer’s disease. It helps prevent osteoporosis and fight heart disease. We can compensate for this by: Eating a balanced diet and getting more calcium. Soaking up a moderate amount of sun each day. Getting enough sleep. Avoiding stress, alcohol, tobacco, and caffeine, all of which make it harder to get a good night’s rest, depriving us of the melatonin we need. A stoic attitude—serenity in the face of a setback—can also help keep you young, as it lowers anxiety and stress levels and stabilizes behavior. This can be seen in the greater life expectancies of certain cultures with unhurried, deliberate lifestyles. Frankl explains that one of the first questions he would ask his patients was “Why do you not commit suicide?” Usually the patient found good reasons not to, and was able to carry on. What, then, does logotherapy do? The answer is pretty clear: It helps you find reasons to live. Logotherapy pushes patients to consciously discover their life’s purpose in order to confront their neuroses. Their quest to fulfill their destiny then motivates them to press forward, breaking the mental chains of the past and overcoming whatever obstacles they encounter along the way. Based on his own experience, Frankl believed that our health depends on that natural tension that comes from comparing what we’ve accomplished so far with what we’d like to achieve in the future. What we need, then, is not a peaceful existence, but a challenge we can strive to meet by applying all the skills at our disposal. Better living through logotherapy: A few key ideas We don’t create the meaning of our life, as Sartre claimed—we discover it. We each have a unique reason for being, which can be adjusted or transformed many times over the years. Just as worry often brings about precisely the thing that was feared, excessive attention to a desire (or “hyper-intention”) can keep that desire from being fulfilled. Humor can help break negative cycles and reduce anxiety. We all have the capacity to do noble or terrible things. The side of the equation we end up on depends on our decisions, not on the condition in which we find ourselves. Do what you should be doing. We shouldn’t focus on eliminating symptoms, because recovery will come on its own. We should focus instead on the present moment, and if we are suffering, on accepting that suffering. Naikan meditation Morita was a great Zen master of Naikan introspective meditation. Much of his therapy draws on his knowledge and mastery of this school, which centers on three questions the individual must ask him-or herself: What have I received from person X? What have I given to person X? What problems have I caused person X? In order to do this, you have to accept that the world—like the people who live in it—is imperfect, but that it is still full of opportunities for growth and achievement. According to a study by Boston Consulting Group, when asked about their bosses, the number one complaint of employees at multinational corporations is that they don’t “communicate the team’s mission clearly,” and that, as a result, the employees don’t know what their objectives are. In business, the creative professions, and education alike, it’s important to reflect on what we hope to achieve before starting to work, study, or make something. We should ask ourselves questions such as: What is my objective for today’s session in the studio? How many words am I going to write today for the article coming out next month? What is my team’s mission? How fast will I set the metronome tomorrow in order to play that sonata at an allegro tempo by the end of the week? Having a clear objective is important in achieving flow, but we also have to know how to leave it behind when we get down to business. When confronted with a big goal, try to break it down into parts and then attack each part one by one. Many such artists might seem misanthropic or reclusive, but what they are really doing is protecting the time that brings them happiness, sometimes at the expense of other aspects of their lives. They are outliers who apply the principles of flow to their lives to an extreme. One of the most common mistakes among people starting to meditate is worrying about doing it “right,” achieving absolute mental silence, or reaching “nirvana.” The most important thing is to focus on the journey. Among Breuning’s other secrets: He had a habit of helping others, and he wasn’t afraid of dying. Imich attributed his longevity to, among other things, never drinking alcohol. THIS is the one that is the most honest and accurate. NO IDEA why I haven't died, but here I am. The eighty-six-year-old filmmaker Frederick Wiseman declared on a stroll through Paris that he likes to work, which is why he does it with such intensity. “Everybody complains about their aches and pains and all that, but my friends are either dead or are still working,” he said. If you want to stay busy even when there’s no need to work, there has to be an ikigai on your horizon, a purpose that guides you throughout your life and pushes you to make things of beauty and utility for the community and yourself. Taira also tells us that volunteer work, rather than money, drives much of what happens in Ogimi. Everyone offers to pitch in, and the local government takes care of assigning tasks. This way, everyone can be useful and feels like a part of the community. There are no bars and only a few restaurants in Ogimi, but those who live there enjoy a rich social life that revolves around community centers. This brings us back to the 80 percent rule we mentioned in the first chapter, a concept known in Japanese as hara hachi bu. It’s easy to do: When you notice you’re almost full but could have a little more . . . just stop eating! Shikuwasa is the citrus fruit par excellence of Okinawa, and Ogimi is its largest producer in all of Japan. Consuming nobiletin has been proven to protect us from arteriosclerosis, cancer, type 2 diabetes, and obesity in general. The book Xiuzhen shishu, known in the West as Ten Books on the Cultivation of Perfection, dates back to the thirteenth century and is a compendium of materials from diverse sources on developing the mind and body. One of the most commonly used mantras in Buddhism focuses on controlling negative emotions: “Oṃ maṇi padme hūṃ ,” in which oṃ is the generosity that purifies the ego, ma is the ethics that purifies jealousy, ṇi is the patience that purifies passion and desire, pad is the precision that purifies bias, me is the surrender that purifies greed, and hūṃ is the wisdom that purifies hatred. We should never forget that everything we have and all the people we love will disappear at some point. This is something we should keep in mind, but without giving in to pessimism. Being aware of the impermanence of things does not have to make us sad; it should help us love the present moment and those who surround us. The tradition of making structures out of wood presupposes their impermanence and the need for future generations to rebuild them. Japanese culture accepts the fleeting nature of the human being and everything we create. Our intuition and curiosity are very powerful internal compasses to help us connect with our ikigai. Follow those things you enjoy, and get away from or change those you dislike. Be led by your curiosity, and keep busy by doing things that fill you with meaning and happiness. It doesn’t need to be a big thing: we might find meaning in being good parents or in helping our neighbors.